This Motor shield for Arduino uses L293 chip allows to driving of two 7-12V DC motors with maximum 1A current. 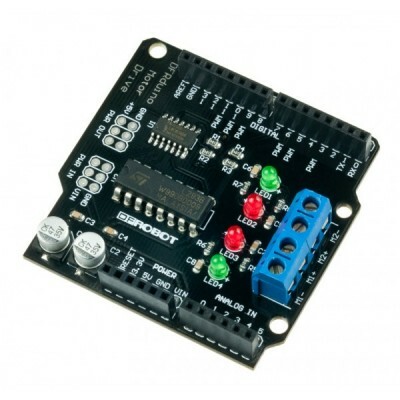 This shield can be directly mounted onto a standard Arduino Duemilanove, Uno, Leonardo or Arduino Mega. 2 way 7-12V motor drive. Up to 1A current each way. PIN 4,5,6,7 are used to drive two DC motors.